“An Open Air Museum ”, Şanlıurfa, with its history dating back to 9000 years ago. The Prophets’ city, where Prophet Abraham (PBUH )was born, Prophet Hiop lived, and which was blessed by Prophet Jesus. You will feel yourself in the distant past of the history while wondering in the historical streets and bazaars of this city. What you will observe in the nature of the inhabitants of this city as inheritance from prophet Abraham and Hiob (PBUT) is the hospitality and the patience, respectively. While stepping onto the land of Harran Plain, you will enjoy the history which reminds you of an ancient period about 4000 years; on the other hand, you will be witness to the prosperity and wealth distributed to the world enabled by the irrigation of Atatürk Dam. Upon departure from Şanlıurfa, having enjoyed all those beauties, you will have a strong desire to visit Şanlıurfa once again along with your friends very soon. As the Governor of this beautiful city, I hereby present my best regards to the Friends of Şanlıurfa, and request you to tell any deficiencies to us but encourage your friends about these beauties. From the finds of surface digs and archeological excavations the history of the Şanlıurfa area reaches back to the Paleolithic Age. During the course of history Şanlıurfa, the scene of various civilizations, has beeen called by the Arabs, Urhai, El-Ruha and Al-Reha and Edessa by the Selvkos. İn Hittite documents of the 2 nd millenium B.C. today’s Şanlıurfa was caled Uras and in Assyrian documents it was called Ruhua ar Ru’ua. Şanlıurfa is called the City of the prophets as Abraham, Job, Jethro and St. George were said to have lived there. Abraham was born during the period of the persecutions of the ruler Nemrut who ordered all tehe children to be killed. His mother gave birth to him in a cave and he lived tehere until he was 10 years old. Abraham came out of the cave and went to his fathers house and began to fight Nemrut and the idols of the people’s temple. When he began to break the idols into pieces Nemrut took Abraham to the castle on a hill and threw him into the fire. After Gods commad to the fire “O fire, be gentle to Abraham and keep him safe and cool”, the fire turned into water and the woods turned into fish. Abraham then fell into a rose garden. In Şanlıurfa the cave where Abraham was born (İbrahim Halilullah Dergahı) and the place where he fell into fire (Halil-ür Rahman Lake), can be visited. Hiob the prophet who was tested by God first by taking all his wealth and children away then by giving him a serious illness also is believed to have lived in Şanlıurfa. Hiob’s body was full of worms and he lived in a cave. In spite of allhis suffers he did never neglect to worship to God and showed patience and thankfulness. God repaid Hiob for his praise by returning his health and wealth. For this reason Hiob is accepted as an example of patience. The cave where Hiob lived while he was sick can be visited. Abgar Ukoma, one of the rulers of the kingdom named Osrhoene wihich existed in the region of Şanlıurfa between 132 B. C. and 242 A.D. is the first king in anciet Near East who converted to christian tity. Abgar Ukoma made known that he accepted christianity as formal state religion by sending a message to Jesus. Following this tradition he invited him to Edessa (Orhay) to preach. Jesus couldn’t come to Şanlıurfa, but he sent a handkerchief on which was visible a miraculous picture of his face. He sent also a letter in which he blessed the city of Edessa The blessing of the city by Jesus is important for tha world of christianity. Since those days Şanlıurfa is called the “Blessed City”. These two Lakes to the soutvest of the city known as the spot where Abraham fell into the fire. The spot is known as Halil-ür Rahman lake where Abraham fell into the fire. According to the legend Nimrod’s daughter Zeliha believing in the new creed of Abraham, cast herself after him into the fire. The spot where she fell is now lake Aynzeliha. The fishes in both lakes are considered sacred and no edible by the people and protected. These places in Şanlıurfa have been visited by visitors from all over the world. Stiuated at the southwestern corner of the lake bearing the same name, this mosque is a complex including a Medrese (Theological schol), cemetery and the spot where Abraham fell when he was casted into the fire. An inscription on the west side of the square minaret at the southeast corner of the mosque, tells us that the mosque was built in 1211 by the command of Melik Eşref Muzaffereddin of Eyyübis. This mosque to has a rectangular plan, and is covered by theere domesranged alng the wall containing the mihrap or niche showing the direction of Mecca. The place of conggregation, in there sections, is covered by there domes flankedn the east and west by half domes. One of the oldest mosques in the city is Ulu Cami. Originally built as Kızıl Kilise (Red Church) in 457 AD, Nurettin Zengi had a mosque built in its place in 1170-1175. The octagonal bell tower of the church is now used as a minaret. The Şanlıurfa castle was built in the 9 th century AD on the site of the hill where Abraham was thorwn into the fire. The columns of the castle dates from 240-242 AD. Of the wals that once surrounded the city the Harran Gate, the Mahmutoğlu Tower of the Bey Gate and in certain places remains of the walls and towers are left. Op the many Ottoman caravanserais (İnn) in Urfa, the best samples are Gümrük Han (Customshouse Caravanserai), Hacı Kamil Han, Mençek Han, Topçu Han, Bican Han, Millet Han and Barutçu Han. Those houses are palatial, and in their desing reflect many influences and considerations. These are te climate, the use of calcareous stone, Islamic beliefs traditional life style of the family, and perhaps above all the fact that a woman’s whole life was spent at home, which therefore had to be spacious and eminently livable. The islamic concept of privacy means that homes are constructed in two sections, one called the “selamlık” for male visitrs and the other called the “haremlik” for female visitors it is in the latter section that the houseold lives. In the direction of Akçakale 44 km. 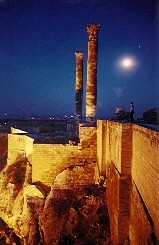 from Şanlıurfa lies Harran. Documents dating from the 2nd millenium B.C. mention this city it was known as an important culture center and place of philosophers. Such Islamic scientists as the doctor and mathematician Sabit bin Kurra, the astronomer battani, the discoverer of the atom Cabir İbn_i Hayyam and the religious person ibn-i Teymiyye were all educated at the Harran University. The Ulu Cami, the oldest and largest mosque built in the Emevi period. The remains of the first Islamic University. The mausoleum of Şeyh Yahya Hayati Harrani. 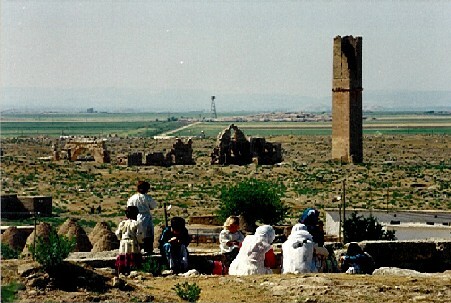 Archeological digs and restoration work in Harran began in 1983, under the direction of Dr. Nurettin Yardımcı in the name of the ministry of Culture and Tourism, will bring the history of Harran into a clearer light. Other ruins of interest in the Şanlıurfa area are the Han-el Ba’rür Caravanserat 20 km from Harran; the ruins of the city of Şualyb; ant the remains of the city of Sogmatar. In the Bedesten near Gümrük Hanı local dress, veils, full coverings for the women, and silk scarves are found. İn the Sipahi Pazar carpets, kilims, fur and saddle bags are found. İn Keçeci Pazar felt is found. İn Hüseyniye Pazar copper is found. İn both the Pamukçu Pazar and the shops near the Yıldız Square one can buy gold and silver jewellery. 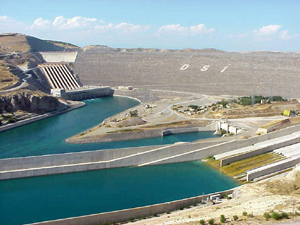 The keystone of the Southeast Anatolian project (GAP) is the Atatürk Dam which can produce 8.9 bilion Kw/h of electric energy annually. The power plant with its eight units, will generate nearly one third of the total energy produced by our country at present. The Atatürk dam takes 8th place in height, 15th place in lake volume, 17th place in hydroelectric production ad 3rd place in body volume tothe similar dams in the world. The dam lake has a capacity to hold 48.5 billion cubic meters of water. The water of Atatürk Dam is transported by two tunnels, each having a tunnels in the world. The water carried by these tunnels will irrigate an area of 730.000 hectares of land including Şanlıurfa, Harran, Mardin, Ceylanpınar, Siverek, Hilvan and Bozova plains. Recently, one of the tunnels is started to irrigate the plain of Harran.